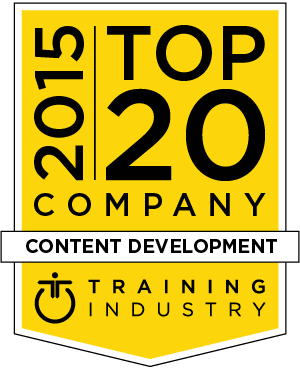 This list recognizes the 2015 Top 20 Content Development companies in the training industry and is designed to help buy-side organizations in their search for the right training partner. IBM harnesses a comprehensive portfolio of learning services and technical training that apply informal, social collaboration and formal courses to empower learners to build their skills and capabilities. IBM offers 30+ years of expertise, advanced analytics and global IT infrastructure management services to drive innovation for your business. Skillsoft's content is multi-dimensional and micro-sized, which allows for flexible training and development solutions that can target the needs of diverse populations. Skillsoft offers a variety of courses and training programs including a sales new hire program, negotiation skills, customer relationship management, and more. Xerox (now Conduent) offers a well-constructed learning and development eco-system that increases effectiveness by connecting employees at all levels to a broad range of content, processes, and technologies to drive performance. DuPont Sustainable Solutions is a learning provider that empowers organizations to transform business results through the development of a safe, efficient and capable workforce. DuPont's comprehensive SCORM compliant courses, cover five key content areas: safety and environmental, human resources, maintenance and reliability, healthcare and government. As part of our commitment to continuously monitor the training marketplace for the best providers and services we announce the 2015 Content Development Companies Watch List. This list recognizes companies from all over the globe that provide content development services. The 2015 Content Development Companies Watch List is intended to help buyers of training services evaluate learning portal providers. CARA provides human performance consulting resources and creates customized training programs for any delivery method, including classroom, webinar, eLearning, mobile and blended. Grovo offers a personalized learner home, available on any device, making it fast and easy to get an organization’s people the knowledge they need, the moment they need it. Grovo gives clients the opportunity to create lessons full of employee-friendly media like videos, gifs and quizzes. Infosys’ Learning Services solves business problems involving learning for global companies. Learning Services’ capabilities span the creation of custom learning content, learning consulting and learning technology integration. Their solutions help modernize global learning and by integrating learning technologies with performance management. Founded in 1982, Future State specializes in instructional design, training delivery, technical writing, project management, planning and analysis, and change management. American Management Association International (AMA) is a world leader in professional development. AMA supports the goals of individuals, organizations and government agencies with a range of corporate talent transformation solutions, including public open-enrollment seminars and onsite group training, with both live and online learning capabilities. Brightwave is a leading global agency for next generation learning solutions, systems and services. They place their expertise, innovation and creativity at the center of our work, designing learning solutions that deliver business objectives and engage learners. VIA helps companies to culturally align and monitor global content across people, channels and geographies, delivering normally disparate activities such as e-learning, translation and community insights under one umbrella. VIA, a certified woman-owned business provides exceptional customer service and high-quality services. Enspire builds learning experiences designed to delight, educate, and change behavior. Enspire creates spaces for people to test what they have been taught, with all of the pressures of the real world, but without the consequences. Cubic's businesses are primarily engaged in the design, development, manufacturing, integration and sustainment of high technology systems, products and services for government and commercial customers. Upside Learning’s custom e-learning solutions are a result of careful considerations, deep understanding of clients’ requirements, budget and timelines, and are based on solid instructional design methodologies, and graphic and media design principles.